Geopolitical tensions stemming from conflict and terrorism in the Middle East pose a bigger security threat to European states than the Soviet Union did at the height of the Cold War, Britain’s ex-MI6 chief warns. 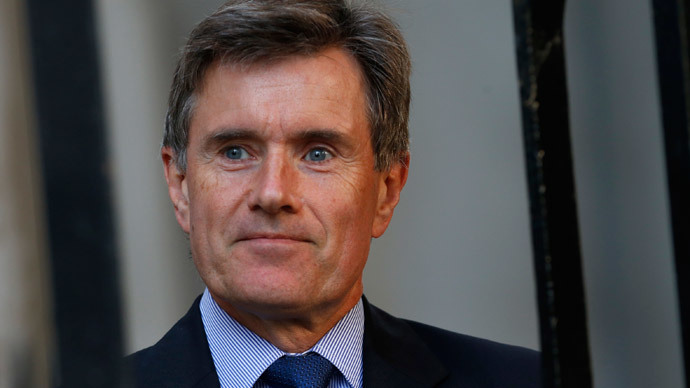 In his first interview since stepping down in November, Sir John Sawers told the Financial Times that brutal terror attacks on European soil are both more likely and more difficult to intercept than ever before. The 59-year-old ex-spy chief said the Charlie Hebdo massacre in Paris alongside recent terror warnings and clampdowns on extremist activities throughout Europe indicate the true extent of the threat. Sawers noted geopolitical tensions throughout the Cold War posed a serious set of problems for Europeans. But he argued the turmoil currently surrounding Europe – driven by unrest in Syria, Iraq, Libya and Yemen – pose more serious challenges. The former MI6 director stressed terror groups'techniques are evolving, as they learn from previous experience and adopt more simplistic tactics. He said Syria was the fulcrum of the problem, but warned that the wider Middle East had reached a critical crossroads. Sawer was a senior diplomat and Middle East expert prior to his role in MI6. He is due to begin a new position as partner and chairman of a consultancy firm that analyses geopolitical risk. On the issue of instability in the Middle East, the ex-MI6 chief argued the dissolution of governments in the region, a dramatic decline in the price of oil, fraught global negotiations with Iran, and the prospect of political uncertainty in Saudi Arabia were major concerns. The former spy chief said Yemen and Libya had become emergent terrorism hotspots, as global attention remains fixed on crisis-ridden Iraq and Syria. “At the moment, most of the conflict in Libya is internally focused … but obviously there is an environment there that could be conducive to terrorist organizations,” he said. Sawers warned, however, that Western governments’ options are limited. “One of the lessons of the last 15 years is that the west can’t impose new solutions on these countries. They have to find their own way forward,” he said. Last week, Europol director Rob Wainwright told the Home Affairs Select Committee that 5,000 European nationals have traveled abroad to fight alongside jihadists, and now pose a terror threat if they return home. On the question of whether national security should trump privacy rights, Sawers said encrypted communications that are inaccessible by state authorities should be subject to certain restrictions. But he emphasized the surveillance debate is merely one of a slew of challenges that will phase governments and large firms in years to come. “The world is much harder to predict. It’s much harder to navigate your way through the fragmentation of power and politics and ideas,” he said. Following Boko Haram’s recent massacre of thousands of Nigerian civilians, the West’s muted response was noted by critics. Despite the bloodshed and carnage the terror group wrought in the West African country, the West’s attention remained largely focused on the Paris terror attacks, and further possible attacks in Europe. In the case of the US administration, Washington’s failure to offer meaningful aid to Nigeria follows a simple logic of no oil, no security support, analysts suggest. Nevertheless, Boko Haram has made considerable territorial gains in recent times, and poses a risk to the security of many Africans states. The Islamist terror group, predominantly based in northeast Nigeria, launched military operations in 2009 with a view to creating an Islamic State in Africa.